Here’s another thing to add to your ‘I really wish they had these when I was a kid’ wish list. If just the thought of running into battle carrying three or four Nerf blasters leaves you breathless, the Battle Racer from Hauck Toys makes it easy to simply roll up with a heavy duty arsenal at the ready. 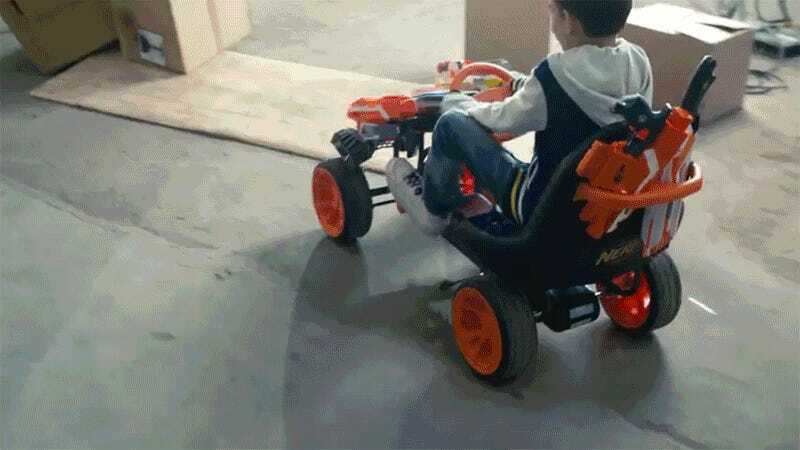 The Battle Racer is essentially a pedal-powered go-kart (with a handbrake for quick tactical stops) that also features multiple mounts and holsters for a wide variety of Nerf blasters and other foam weaponry. A pair of blasters can ride along up front to keep them in easy reach for quick attacks. And in between the two is a clip system allowing the driver to carry a modest supply of backup ammo. And for kids who really want to feel like outlaws, behind the driver’s seat is a pair of slings for holding two additional weapons that can be accessed by simply reaching behind them while they’re at the wheel. Amazon currently lists the Battle Racer as being available now for upwards of $600, but odds are when it officially hits the states it will be priced a little more reasonably given it’s a pedal-powered affair. And no, the whole thing’s not made of Nerf foam, so kids will want to avoid collisions or simply ramming their opponents when their ammo supply runs dry.